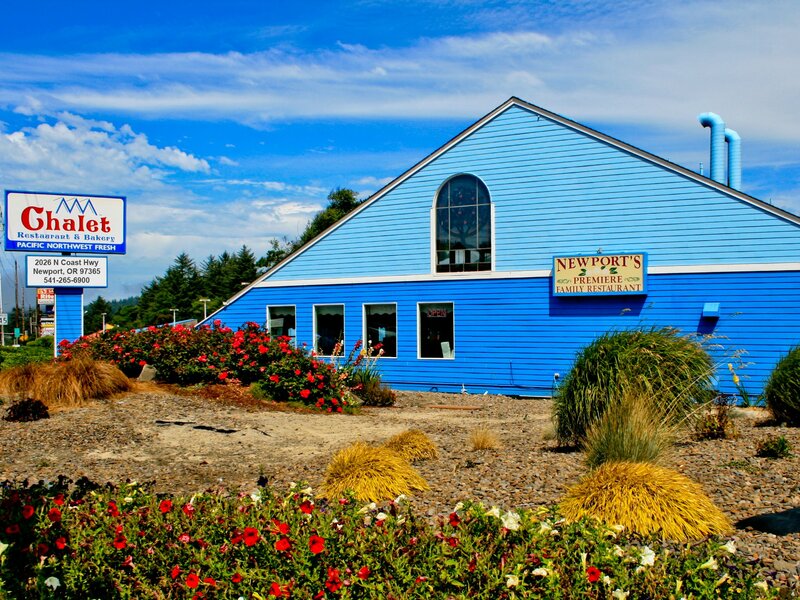 Chalet Restaurant & Bakery is Newport's premier family restaurant. We are family owned and operated for the past 33 years. We feature quality ingredients with a wholesome, friendly atmosphere, and affordable pricing for your family to relax and enjoy. Chalet Restaurant & Bakery offers a diverse selection of breakfast, lunch, and dinner menu items to satisfy every taste, including fresh seasonal dishes. Our batters are homemade from scratch and all are carefully prepared and blended by hand, using only the finest ingredients. We make homemade jams, compotes, and syrups to further enhance our delicious pancakes and waffles. Pot roasts with carrots and onions and fresh Tom turkeys are roasted daily. We use only fresh potatoes for our mashed, baked, or hash browns, never frozen or dehydrated. Homemade soups, gravies, and sauces prepared daily. Nothing can replace fresh products for food value or taste. We feature fresh wild Pacific fresh and Yaquina Bay Oysters.